Dordogne (Occitan: Dordonha) is a department in the southwest of France. It is named after the Dordogne river that runs through it. The department is in the region of Nouvelle-Aquitaine. It is between the valley of the Loire river and the Pyrenees. Its prefecture in Périgueux. Dordogne was formed during the French Revolution on 4 March 1790 with parts of the old province of Périgord. It was divided into nine districts: Belvès, Bergerac, Excideuil, Montignac, Montpon, Nontron, Périgueux, Ribérac and Sarlat. Bergerac, Périgueux and Sarlat-la-Canéda were alternatively the capital of the department but later it was decided that only Périgueux would be the capital. Dordogne is part of the Nouvelle-Aquitaine region. It is the third largest department of Metropolitan France, after Gironde and Landes. It has an area of 9,060 km2 (3,498 sq mi). The highest point of the department is in the Vieillecour forest and is 478 m (1,568 ft) high; the lowest point is in the valley of the Dordogne river and is 16 m (52 ft) high. The department is bordered by the departments: Charente, Haute-Vienne, Corrèze, Lot, Lot-et-Garonne,Gironde and Charente-Maritime. The main river in the department is the Dordogne. That gives its name to the department. It runs from east to west through the department. Other rivers are the Isle and the Vézère, both tributaries of the Dordogne. Dordogne is part of the region of Nouvelle-Aquitaine. 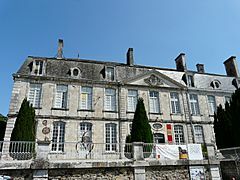 It is managed by the General Council of Dordogne in Périgueux. There are 4 arrondissements (districts), 25 cantons and 557 communes (municipalities) in Dordogne. The inhabitants of Dordogne are known, in French, as Dordognais (women: Dordognaises). They are also known as Périgordins or Périgoudins. in 2012, the department of Dordogne had a population, of 416,384, for a population density of 46.0 inhabitants/km2. The arrondissement of Périgueux, with 188,523 inhabitants, is by far the largest. The other three, Bergerac, Nontron and Sarlat-la-Canéda, have respectively 111,727, 41,1064 and 75,028 inhabitants. Dordogne Facts for Kids. Kiddle Encyclopedia.